Above photo showing the "Kentish Yeoman" in Seal. Date unknown. Above postcard circa 1933, kindly sent by Rory Kehoe. Above photo 2008 by Trevor Harris Creative Commons Licence. 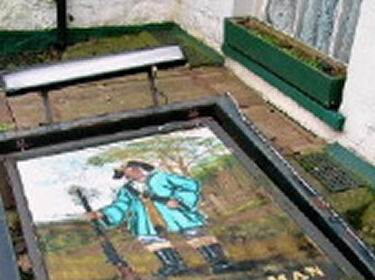 The sign of the "Kentish Yeoman" in 1987 displays not a be-smocked farm-worker, but a fierce eighteenth century infantryman complete with rustic gun. Hopefully someone has a picture of this and can send it to me for display. From the Whitstable Times, 16 March 1867. Price 1d. THE MARQUIS OF CAMDEN V. UPTON. Mr. Brown, Q.C., and Mr. White were for the plaintiff, and Mr. Montague Chambers, Q.C., with Mr. Kemp for the defendant. 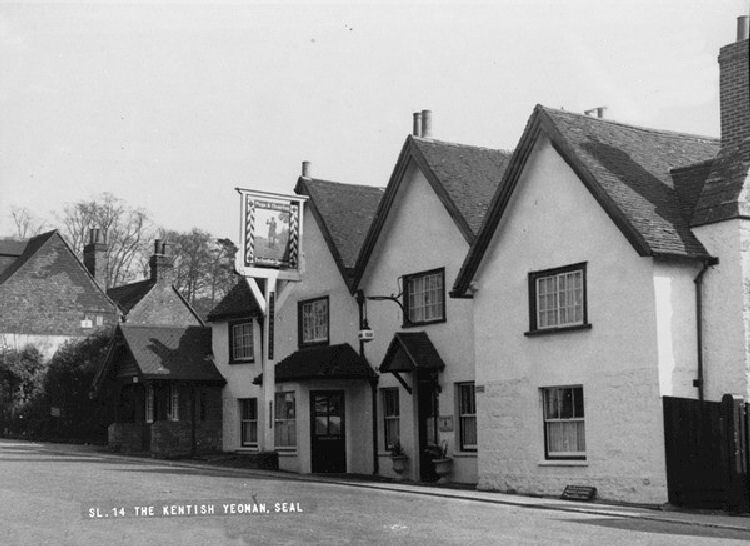 This also was an action of ejectment, to recover possession of the “Yeoman Inn” at Seal, near Sevenoaks. The simple question was whether the defendant held under a Michaelmas or a Lady-day tenancy. At the suggestion of his Lordship the learned Council engaged consulted, and it was arranged that a verdict should be entered for plaintiff, but that the defendant should not be required to give up possession until a valuation had been made. Kentish Mercury 29 January 1870. The annual rent audit of the Marquis Camden, Wilderness Estate, took place on Wednesday last, at the "Yeoman Inn," Seal. The tenants, who were received by his lordship's agent, Mr. Roberts, mustered in strong force, and at the conclusion of the business an excellent spread was placed before them by the Host and Hostess White. Mr. Roberts presided, having for his vis-a-vis Mr. Wm. Cronk, of Fuller-street Farm. The usual healths and complimentary toasts followed the excellent repast, and the evening was, as might be expected, very joyously spent. Sussex Courier 02 January 1878. At the Sevenoaks Petty Sessions on Friday last, an extension of time until 12 o'clock was granted to Mr. Richard White, of the "Kentish Yeoman, on the occasion of two balls being held at his house. 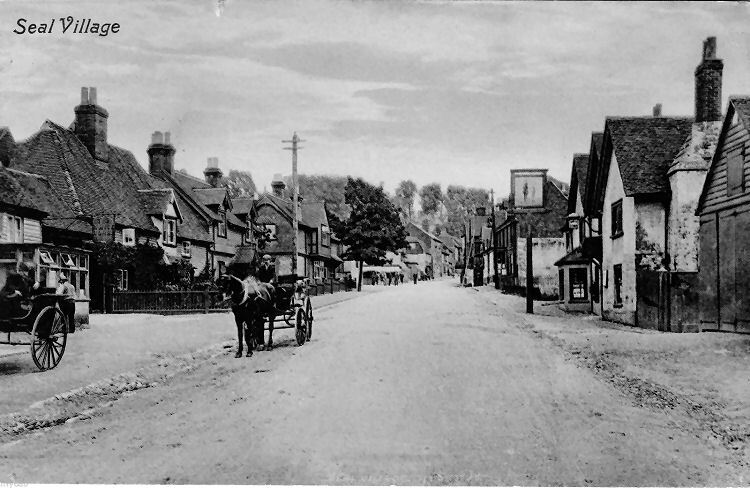 Sevenoaks Chronicle and Kentish Advertiser, Friday 25 May 1883. The annual dinner of this old-established Friendly Society took place on Monday last at the "Yeoman Inn," Seal. As is usual on such occasions, the festivities were not confined exclusively to the members and friends of the club, efforts being made to make it a merry time for juveniles. In the main street were Ranged several stalls such as are usually seen a country feasts and fairs, laden with a variety of edibles, so delightful to youthful palates. At convenient spots stood a shooting gallery, swings, a round-a-bout, and other amusements, which present powerful attractions to youths and maidens, and sometimes make dizzy men, possessed of spare cash, dizzier. The weather was magnificent. Scarcely a cloud was to be seen, and the sun shone brightly, tending greatly to impart gay and festive feelings in the minds of holiday makers, and aiding the instrumental and vocal musicians in their endeavours to make the proceedings animated and joyous. Kent & Sussex Courier 14 September 1887. An application was made by Mr. Warren, landlord of the "Kentish Yeoman," Seal, for an extension of time, on the occasion of the annual tennis match, on Thursday next September 15th, and it was granted. Another application for an outdoor license, by the same person on the same day, was also granted. Sevenoaks Chronicle and Kentish Advertiser 25 August 1916. PUBLIC NOTICE. RE: GEORGE WARREN, DECEASED. 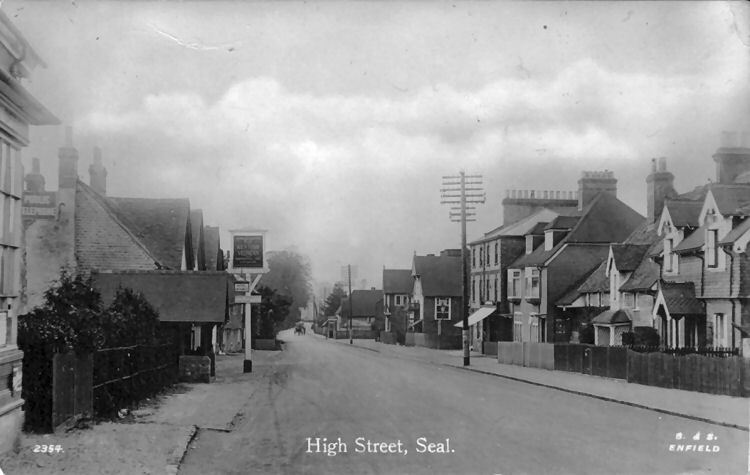 ALL Persons having any claim or demand against the Estate of the late George Warren, of the "Kentish Yeoman," Seal, in the County of Kent, Licensed Victualler, who died on the 11th August, 1916, are requested to send in particulars thereof forthwith to us the undersigned. Dated this 22nd day of August, 1916. 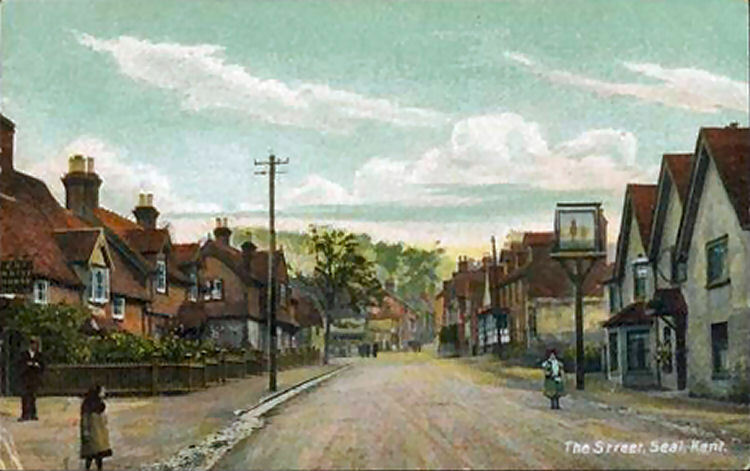 Solicitors to the Executors, Sevenoaks, Kent. In Seal, the "Kentish Yeoman" stands empty and crumbling, the rotting, fallen pub sign an indication of its decay. From the http://www.sevenoakschronicle.co.uk 22 March 2012. 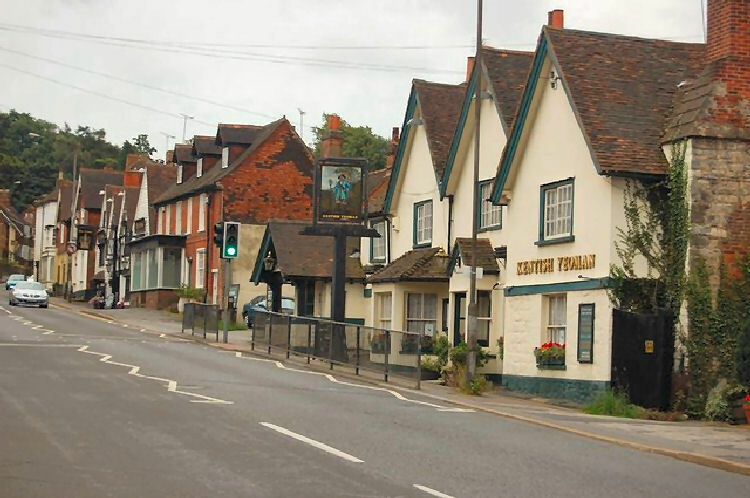 A plan to turn a community pub into a housing complex has been given the green light. The "Kentish Yeoman" in Seal High Street has been the subject of fierce debate since July last year after it closed down in 2010 due to a lack of business. Landlord Jamie Brady lodged a planning application to turn the listed building and summerhouse into a four-bedroom home, a three-bedroom home and a two-bedroom home. 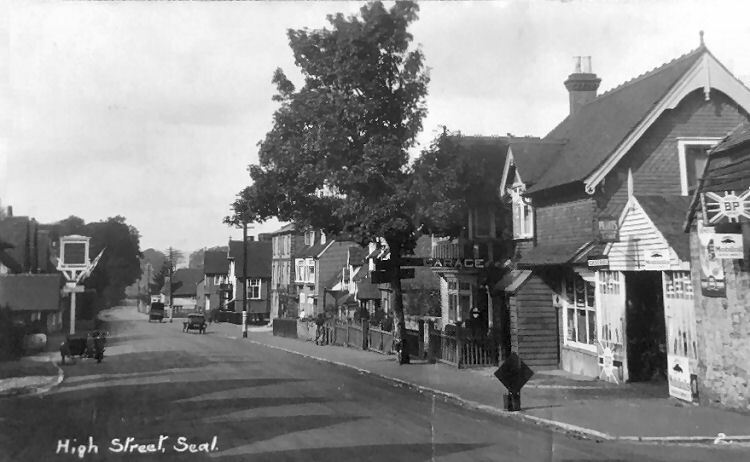 Seal Parish Council recommended refusal, noting The "Crown" pub further along the street had already closed and the one remaining pub, the "Five Bells" in Church Road, was struggling to handle the level of custom due to a lack of parking spaces. The matter was sent to Sevenoaks District Council's (SDC) Development Control committee, which ruled last Thursday that the application should go ahead – with a number of conditions attached. Mr Brady can begin work, as long as he makes a financial contribution to affordable housing in the village under a Section 106 agreement. No development can take place until SDC has approved separate details such as landscaping, materials and parking. Speaking at the meeting, Mr Brady – who grew up in Sevenoaks and went to Wildernesse School – said taking over the pub had been "a dream come true" but business slumped after the "Five Bells" reopened. He added: "Standing there at 9pm on a Saturday night with only one customer was no fun for anyone. "Social networks mean the pub culture has changed, as people don't meet to chat anymore. "These family houses mean local businesses will benefit." Town councillor Roderick Hogarth spoke out against the application, noting: "I really feel there's not enough justification to take away the local amenity." 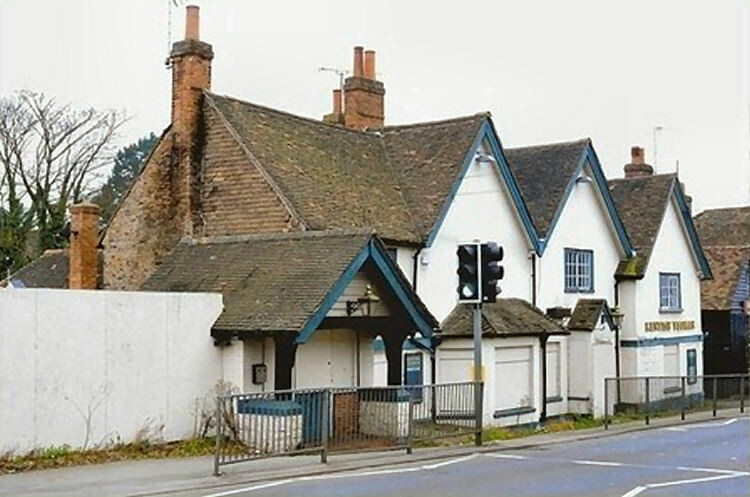 But district councillor Michelle Lowe said: "It is sad to lose a pub but the houses are a beautiful design." Elsewhere, work continues to turn The "Crown" pub into an office block. It is unknown when the construction will be completed, but Keith Fox, agent for A-Tec Developments, the firm behind the redesign, said it may be ready early next year. The building gained a Grade 2 listing on 16 January 1975. It is believed to have been built around 1200 and used to be a carriage stop. In the 15th century it was used as a Hall house. In both 1984 and 2000 the pub were winners of the Bat and Trap league division 2. In 2012 the local council approved for the building to be converted into one 4 bedroom and one 3 bedroom dwellings. I am told it was demolished in 2013 and houses built on the site. So much for its listed status.